The company name is Thunderbird Products and thus the Thunderbird emblem you notice next to the Formula name on the boat. A Thunderbird boat made the first successful sterndrive crossing from Miami to Nassau in 1959. Formula was the famous offshore racer Don Aronow’s first boat company. The two brands merged in 1964 and were subsequently purchased by Vic Porter in 1976 who moved production to its current location in Decatur, Indiana. Vic Porter, his wife, their four children plus several grandchildren are all still intimately involved with the building of Formula boats. 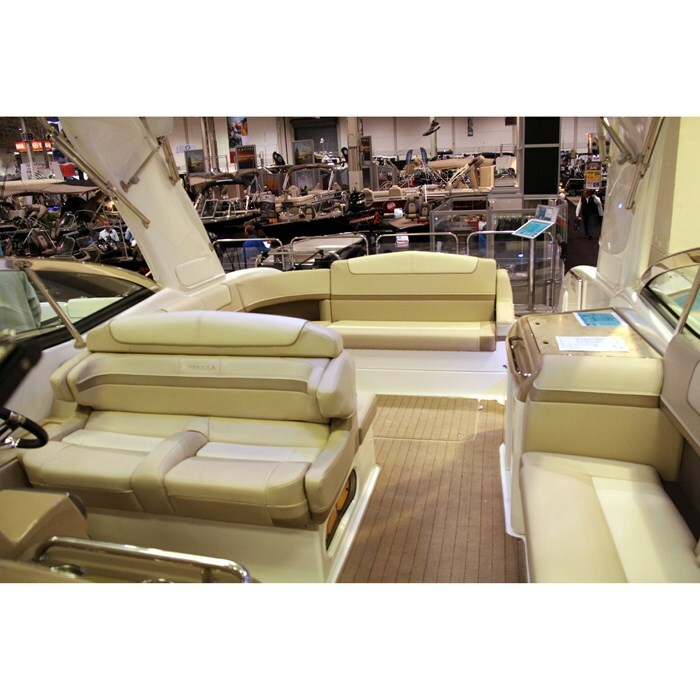 For 2014, Formula offers thirty models of bowriders, cuddies, cruisers, yachts and high performance boats from twenty-four to forty-five feet. The 350 CBR (Crossover Bowrider) is not a new model for 2014, and at thirty-five feet on a ten-foot, nine-inch beam, is the largest of the five model bowrider series starting at twenty-four feet. Bowriders by all manufacturers seem to be getting bigger and bigger every year and offering more and more amenities and flexibility and this 350 CBR is one of the biggest and most flexible of all. 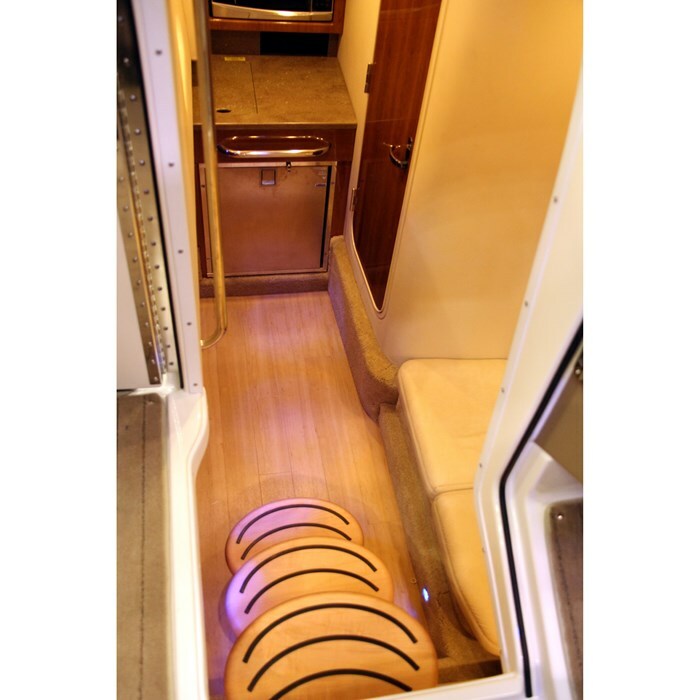 In fact, it offers almost full cruiser amenities – in a bowrider configuration. When you first step aboard this boat – any Formula – stop for a moment and take in the quality and detail of materials, of the fit and finish for which Formula is known. The standard equipment list on this 350 CBR is exemplary. 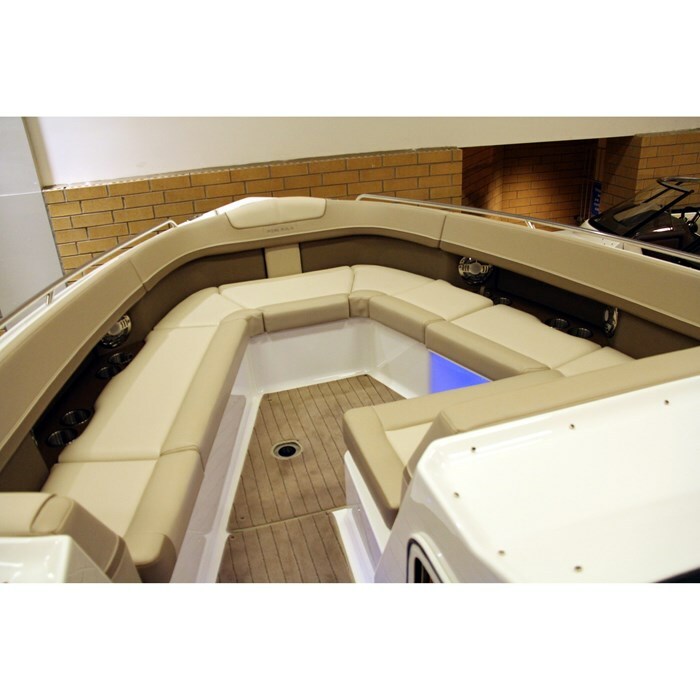 Immediately above the integrated swim platform which may be optionally fitted with an extended watersports platform closer to the waterline is a transom trunk above which is an aft-facing sun lounge which converts to a full length sunpad. 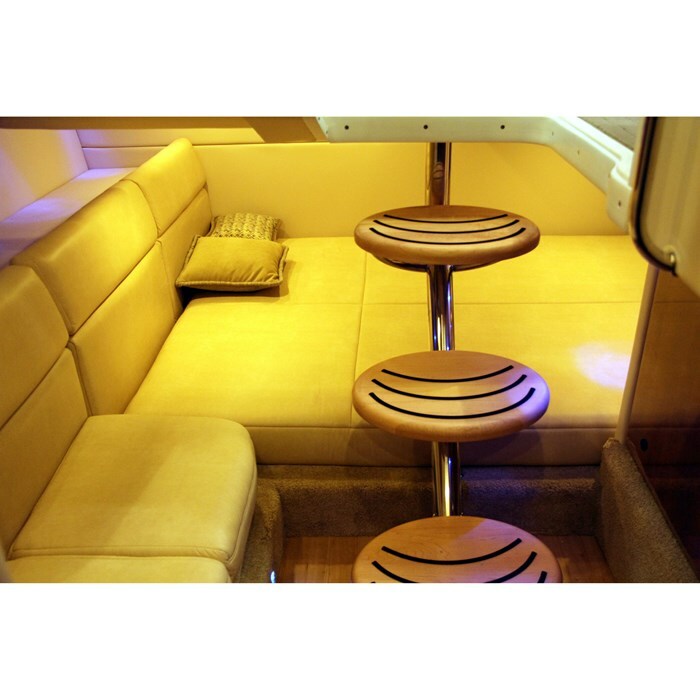 A huge convertible U-shaped starboard side lounge has a dual-height cockpit table with standard filler cushion. All cockpit seating features StarLite® XL synthetic bases with DriFast® foam, PreFixx® coating, and even stitched with Tenera® element-resistant thread. Opposite this lounge is a molded wetbar with sink, Corian® countertop, a portable 36-quart Igloo® cooler, and trash container. Forward of this on the portside is another lounge seat with the double-wide, dual-position helm and companion seat opposite this on the starboard side. The helm of the 350 CBR features Livorsi® hi-performance domed instrumentation and chromed shifters. 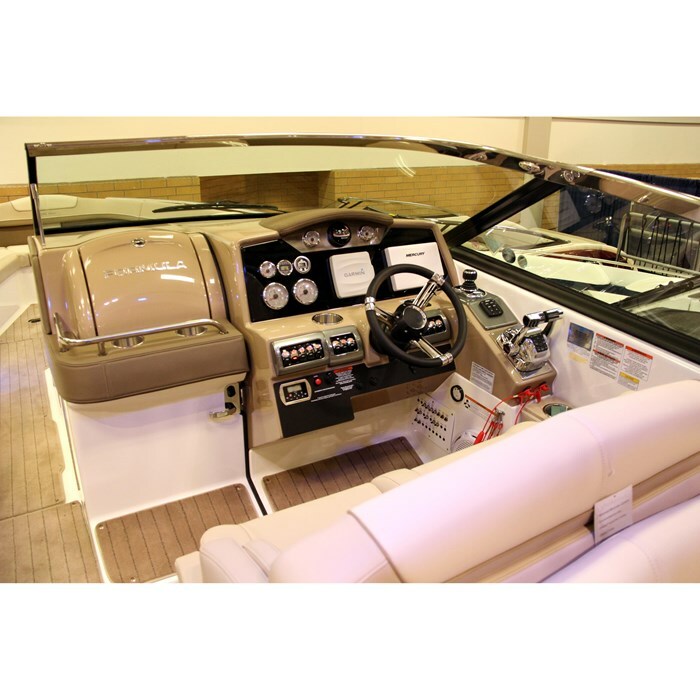 Included here is a custom Dino® tilt steering wheel, digital depth sounder, Garmin® GPS chartplotter, plus Bennett® trim tab switches with indicators – all standard equipment. There are fifteen strategically placed stainless steel drinkholders throughout the cockpit and the blue/white LED courtesy lighting comes with a hand-held remote control. Storage is everywhere you look. Forward through the left-of-centre walk-through to the bow is complete surrounding bolstered seating with a double or even triple-wide forward-facing seat ahead of the helm console with a filler cushion on the starboard side ahead of it to allow lounging or remove it for seating. A two-section table fully caters to everyone in this bow area and the entire bow area can be cushioned and even blocked off into a massive sunlounge. On the foredeck is an anchor locker serving the through-hull anchor roller which may be equipped with an optional windlass. At this point you may well ask why this boat is so different from any other bowrider. The piece de resistance lies in the door leading from the helm a few steps down into a full cabin below. 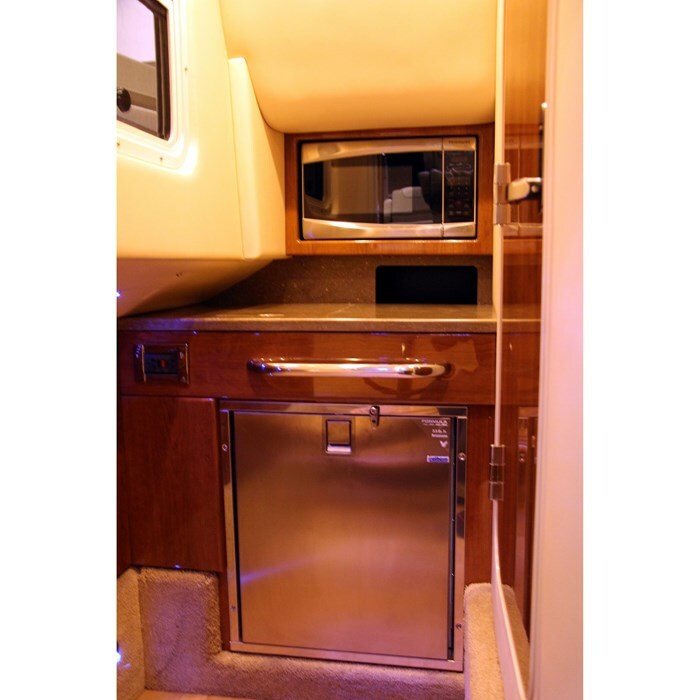 This cabin includes a mid-cabin full-size berth with Sensus® memory foam mattress, hanging locker, a convertible curved UltraLeather™ sofa with dual-height deep cherry wood table with filler cushion, a complete galley with Corian® countertop, stainless sink and refrigerator, electric stove, microwave oven, plus hardwood dovetailed drawers, plus storage. 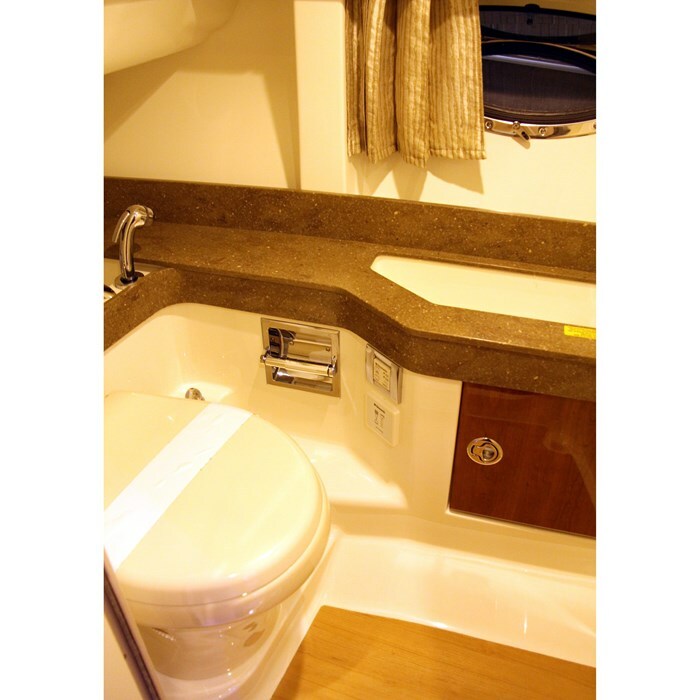 Also down here is a molded head compartment with vanity, sink, retractable shower head, and VacuFlush toilet. Two Bomar® hatches with screens plus four screened opening portlights offer ventilation and natural lighting. 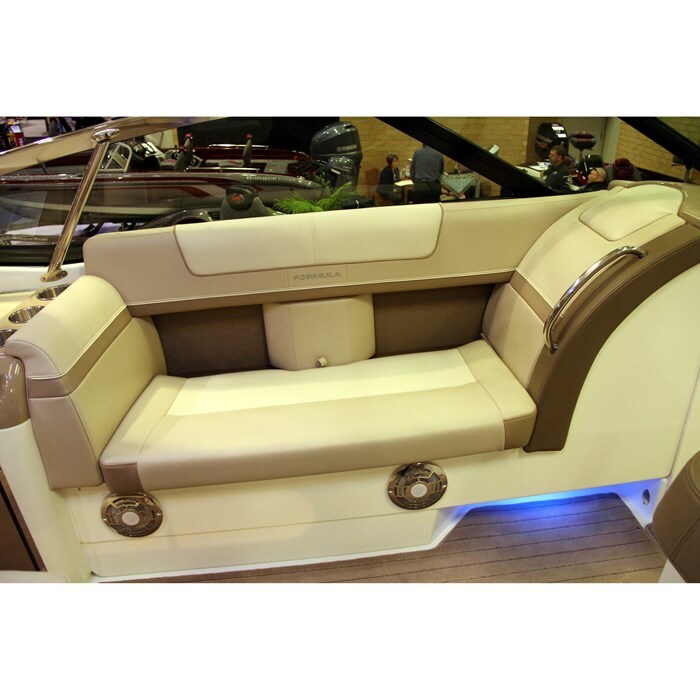 Standard entertainment is from a Clarion® AM/FM/CD stereo with remote controls at the helm and transom and with speakers mounted throughout the boat. Notable optional equipment includes about forty choices of standard or optional Imron® hull graphics colours and styles plus four standard and two designer décor choices for the cabin. 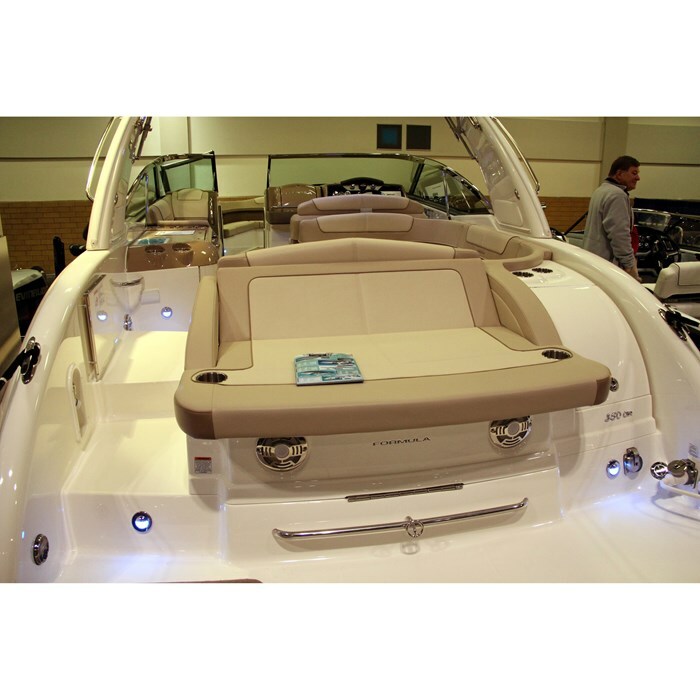 A bimini top is standard or choose a radar arch, sport arch or even a sport hardtop with available SureShade ATF® electric power retractable sunshade. Also available is a 5KW generator, air conditioning/heating, two cabin 24” LCD HDTV/DVD combo units, lots of stereo upgrades, MerCruiser ® Axius™ or Volvo Joystick control, upgraded Raymarine™ electronics, a transom-mounted propane grill, and lots of canvas coverings and enclosures. The Formula 350 CBR is truly one big and flexible bowrider almost like no other.